A Family Affair Boxed Set 2, Books 4–6, is about so much more than a secret family. Set in the small town of Magdalena, New York, the people have big hearts and good intentions…at least most of them do! Magdalena is a place of family, forgiveness, redemption, and second chances. And hope. Lots of hope. This town, and the people in it are about helping others get through the tough times and broken dreams, and doing it with the help of family, friends, sometimes even strangers. Gina Servetti was raised to believe she wasn’t enough—not thin enough, not pretty enough, not clever enough. She’s more comfortable with a spreadsheet than a conversation and doesn’t trust easily, especially where men are concerned, most notably the good-looking, smooth-talking ones like Ben Reed. When city boy Ben Reed arrives in Magdalena, he’s not planning a long-term stay in a town filled with too many busybodies and too little excitement. He just needs things to settle down in Philly for a few months before he returns to his old life and his plan to win back his ex-wife. But once he gets to know the people in this town, he starts to care about them: one in particular—Gina Servetti. The longer he’s around her, the more he realizes she’s so much more than a woman with a scowl and a sharp tongue. She’s real and honest, and as afraid of trusting as he is. But can Ben and Gina open up and take a risk for a chance at real love? Well, if the rest of the town has anything to say about it, and they always do, this couple will take the big leap and end with an “I do”! They should have been married and working on their “happily ever after” but fate intervened and stole their chance. Can the residents of Magdalena help them get it back and give them a second chance? On the day Michael Androvich stands at the altar before family, friends, and most of the town of Restalline, Pennsylvania, he’s prepared to pledge his life, love, and fidelity to the woman who owns his heart. There’s only one thing missing—the bride. Elise Pentani loves Michael Androvich truly and completely, but there’s a tiny piece of her that believes he’ll fall back into his “bad boy” ways. When a threat from his past visits her, Elise lets doubt rule and skips her own wedding. Nursing a broken heart and determined to forget the woman he can’t forget, Michael heads to Magdalena, New York to secure a business deal for his family’s lumber company. He’s not prepared for the endless questions and inquisitive nature of the residents who remind him an awful lot of his hometown. 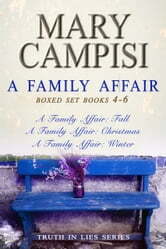 What happened before A Family Affair began? These questions are answered in my new Park Bench series. These short stories make the perfect park-bench read and are named after the signature park-bench covers.